This interview was recorded on Feb 19, 2019 at KZSU 90.1 FM (Stanford University). Kamel El Basha or Kamel el-Bacha (in Arabic كامل الباشا) (born in Jerusalem on 14 March 1962) is a Palestinian theater/film actor and director who won the 2017 Volpi Cup for Best Actor at the 74th Venice International Film Festival for his role as Yasser Salameh in the Oscar nominated film 'The Insult' (also known in Arabic: قضية رقم ٢٣‎, translit. Qadiyya raqm 23, lit. 'Case No. 23') by award winning Lebanese film director Ziad Doueiri. This interview was conducted by Stanford Lecturer Dr. Ramzi Salti along with Dr. Samer Al-Saber, Assistant Professor of Theater and Performance Studies at Stanford. 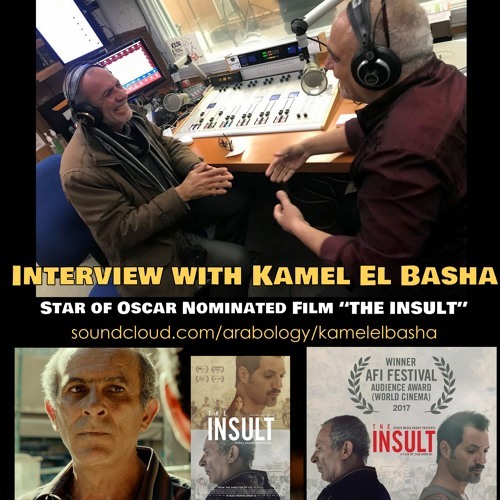 Download Interview with Kamel El Basha, Star of Oscar Nominated Film "The Insult قضية رقم ٢٣"
Users who like Interview with Kamel El Basha, Star of Oscar Nominated Film "The Insult قضية رقم ٢٣"
Users who reposted Interview with Kamel El Basha, Star of Oscar Nominated Film "The Insult قضية رقم ٢٣"
Playlists containing Interview with Kamel El Basha, Star of Oscar Nominated Film "The Insult قضية رقم ٢٣"
More tracks like Interview with Kamel El Basha, Star of Oscar Nominated Film "The Insult قضية رقم ٢٣"